I finally succumbed. I saw a few articles touting the video features that were moved out of the Extended versions of Photoshop into the standard version. Since I’ve been doing a fair amount of opportunistic timelapses using the free tool Picsasa it seemed like the experience was worth the $200 upgrade outlay. With some of my past escapades with upgrades of Adobe Photoshop still searing my psyche (3 to 5 was especially traumatic), I proceeded anyway. First I made sure to buy the upgrade ON DVD. It means I have to store something, but it also means it’s a physical thing – not a space eating behemoth to add to my bulging file archives that might get lost or deleted. Let me step back a moment and explain that I do my photo processing on two different machines. A laptop which is with me much of the time and a desktop machine at home. The desktop machine is my wife’s and she’s beginning to get the idea it’s not really for her use. I should also point out that I am an “IT Professional”. Herding around arcane settings on Windows is just one of the many things I do on a daily basis. I also do not have or use a Mac. There, I said it. I’m not a Mac hater. Heaven knows I’ve spent a great sum of money on iPhones and other Apple gear. But I’ve never been able to convince myself that switching to a Mac and giving up all my fancy PC-only software was worth the risk, frustration and significant additional expense. But I digress. I tackled the upgrade on the desktop machine first. The DVD arrived 5 days after I ordered it from Adobe. 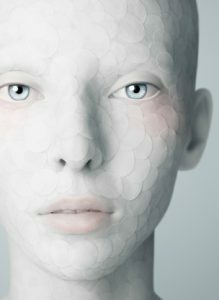 Inside the packing box I came face to face with creepy Pale Faced Scaly Woman. It happens she’s not really a box, but a slip case covering another box. Inside the box is yet another box. And inside the box that is inside the box inside the other box is another box – a CD jacket actually. You have to inspect all the edges of the slip case to find out this is an “upgrade” – I thought at first they had sent me the wrong thing – a full version (which I’d have welcomed). I hurled the DVD into the drive. Since I have disabled auto install (no smart person would allow an inserted DVD to automatically run anything), I hunted down the rather odd place where the setup program lived and started it. It whirred and eventually it offered to install. After some more whirring it asked me for the serial number. Crap, I thought, I don’t know where I had written that down and then I remembered it’s registered under my Adobe ID. I looked it up, wrestled with the serial number entry tool that tries to be helpful but which actually makes entering the digits harder and pressed GO. Invalid serial number. It told me unceremoniously. Perhaps I made a digit mistake. Yes, I did. I fixed it and THEN: “Invalid Serial Number”. How can it be that my serial number which is recorded at Adobe is wrong, I wondered. I began a search of the Adobe Website. Call me dense, but after trying to use the “contact an agent” pop up that gets in your face when you visit Adobe and getting no contact; after scanning a half dozen useless articles that were returned from my Adobe site search I discovered that it didn’t want my moldy OLD serial number. The elusive Serial Number I needed was written on a sticker or printed on the packaging material. It WASN’T on the CD case. It wasn’t on the alien lady slip case. It wasn’t on the box held by the alien lady. Oh wait, it was on the box inside the box, inside the box just NOT on the DVD or CD cover. That’s consistent with the way you find things in Photoshop. You know, when you need the ruler tool you have to first consult the eyedropper (or sampler or note) tool. Of course I did what I always do and I immediately wrote the serial number directly on the DVD in indelible ink. The upgrade proceeded pretty quickly and Photoshop 13 installed. 13? Yes, for arcane historical reasons you need to know that Photoshop CS6 is REALLY Photoshop 13. The luckiest Photoshop yet! When you look at your Adobe account you’ll notice that it doesn’t say CS6 apparently that would have been too many digits and letters to add after “Photoshop” on the web page and it might have made it just a bit too clear what it is. But I guess I should be thankful that now it has an icon! Now comes the sharp poke. When I started CS6, er, I mean 13, it asked me if I wanted to import my presets from the previous version. Why YES, thank you. Except apparently “presets” means ONLY presets – my custom settings for correcting light pollution using the Levels adjustment tool. And to add insult to injury… guess what you CAN NOT DO… you cannot have both CS5 and CS6 (I mean 12 and 13) running simultaneously – so you can NOT do a head to head comparison to figure out what is missing. After reading some more about “migrating filters” (and great good luck to you on finding something on that since Adobe calls them Plugins even though I have only ever known them as filters) I realized that I am on the hook to reinstall all my filters and actions by hand on EACH machine that I use Photoshop on. And it MIGHT exist, but why, oh why does Adobe not have a findable page on the 99 things you may need or want to do when you “upgrade” their product(s)? I have a suspicion that they don’t publish an all-in-one compendium because if people found it they would have justifiable fear and trepidation about attempting an upgrade. It might in fact, lessen their sales. Now before you conclude that I hate Adobe that’s not at all true. I only hate SOME of them – the ones who fail to anticipate how new and veteran users are likely to suffer when trying to use their heavily featured product(s). I’m sure my loathesome-ness will subside, eventually. Meanwhile I am REALLY glad I didn’t go with the Cloud thing. I am subscribed to several discussions and every day there is a new horror story about failure and misadventure that make my serial number search look like a vacation. This entry was posted in Photo Processing, Photoshop, Ravings and tagged anguish, CS5, CS6, disappointment, features, new, pain, Photoshop, timewasting, trepidation, Upgrade on January 25, 2013 by Steven Christenson. A particular bit of pain that I experienced was that there is a setting for “show transform controls” when you use the nudge (move) tool. In my previous use I had either left this checked, or it was the default for it to be checked. In CS6 I was apoplectic that I could not rotate or resize my smart objects (e.g. 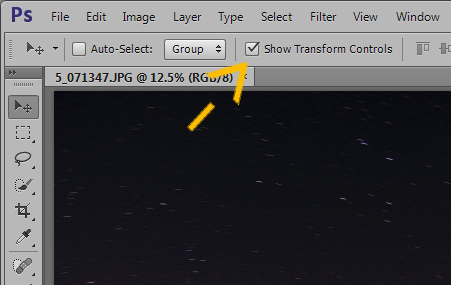 my Watermark) in the manner I was accustomed until I noticed the little checkbox was not checked. Also, as I noted in windows you cannot start both PS CS5 and CS6. If you have CS5 open and attempt to start CS6 it just pops your CS5 window back to the top (and v.v.) I found no solution for this. Thanks, I still haven’t found that triangle.